We’ve been busy at Spreadwing Farm, with a bunch of new building projects. One of them is a new workshop and packing shed complete with straw bale walk-in coolers. I’d like to show you what we’ve been doing and invite you back into the mud and straw. 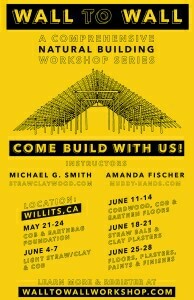 Please join us for one or all 3 of these upcoming workshops! Let me know if you have any questions. Here’s mud in your eye! Join me for a 6-day hands-on workshop June 14-19. 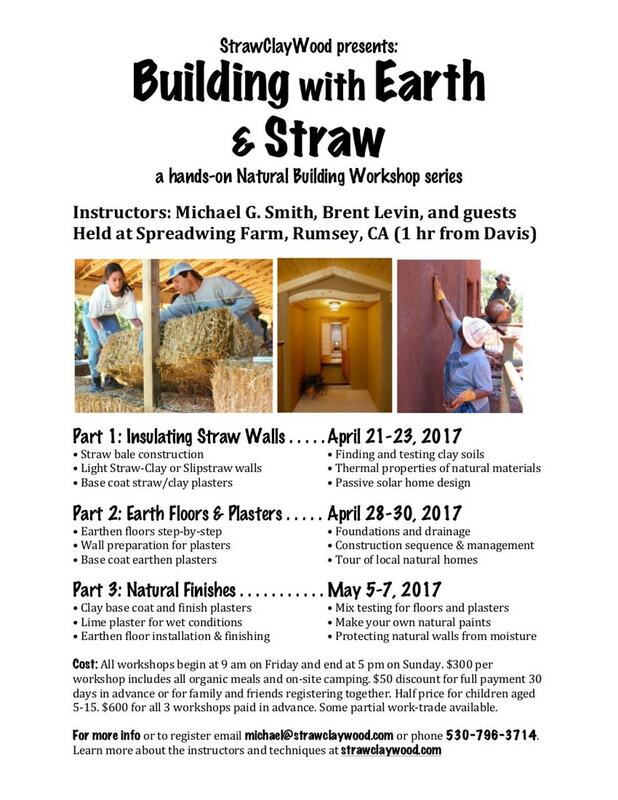 This hands-on workshop focuses on easy-to-learn, low-cost, environmentally-friendly building strategies especially appropriate for our climate. Beginning with an earth-sheltered steel shipping container, we will be attaching a straw bale wall on the south side for insulation, with windows for passive solar heating. We will also begin construction of a cob (sculptural load-bearing earth walls) studio, recessed into the ground with a low-impact earthbag foundation. 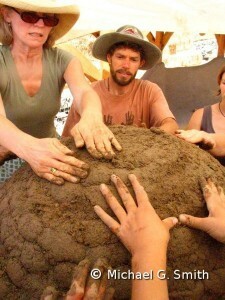 Clay soil from the site will be used for cob and for plastering the straw bales and earthbags. About 6 hours each day will be spent building together, with an additional 2-4 hours of lectures, presentations, and a tour of local alternative buildings. 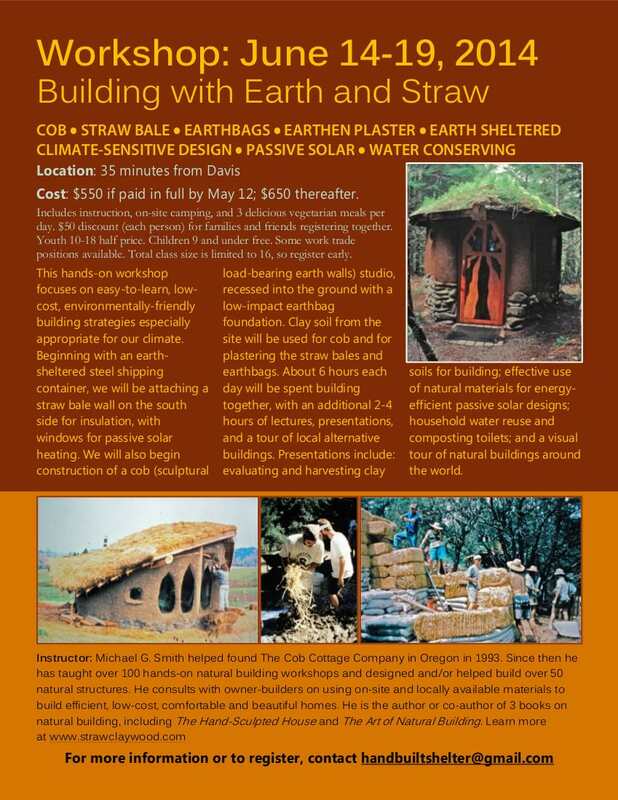 Presentations include: evaluating and harvesting clay soils for building; effective use of natural materials for energy-efficient passive solar designs; household water reuse and composting toilets; and a visual tour of natural buildings around the world. Instructor: Michael G. Smith helped found The Cob Cottage Company in Oregon in 1993. 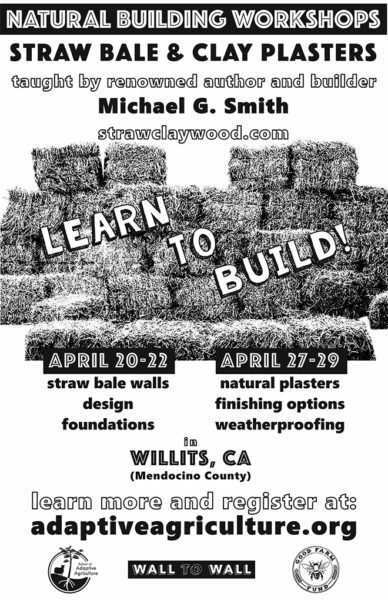 Since then he has taught over 100 hands-on natural building workshops and designed and/or helped build over 50 natural structures. He consults with owner-builders on using on-site and locally available materials to build efficient, low-cost, comfortable and beautiful homes. He is the author or co-author of 3 books on natural building, including The Hand-Sculpted House and The Art of Natural Building. Cost: $550 if paid in full by May 12; $650 thereafter. Includes instruction, on-site camping, and 3 delicious vegetarian meals per day. $50 discount (each person) for families and friends registering together. Youth 10 – 18 half price. Children 9 and under free. Some work trade positions available. The total size of the class is limited to 16, so register early. Cost: $60 if paid by Sept 20; $75 thereafter. Includes a delicious organic lunch. Kids under 10 are free. Wood-fired, retained heat ovens have been used for millennia all around the world to bake everything from bread and pizzas to meat and vegetables. Learn to build your own from inexpensive natural materials: clay, sand, straw, and bricks for the floor. This is a great first project for anyone who wants to learn to build with earth and everyone who loves good home-cooked food. 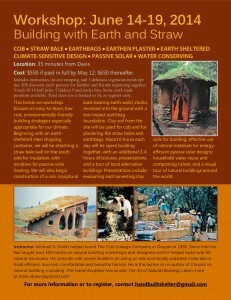 Michael G. Smith has been building with earth and straw since 1993, when he helped found the Cob Cottage Company in Oregon. He is the author of “The Cobber’s Companion” and co-author of “The Hand-Sculpted House” and “The Art of Natural Building.” He has built over 20 earthen ovens in workshop settings, at private homes, educational centers, a restaurant, a cooking school, and a community center. To register or for more information, contact me. Do you want to be informed of my upcoming workshops? Sign up here and you will get an email notice every time I schedule a new workshop. I will not use your email address for any other purpose or sell or give it to anyone, ever.